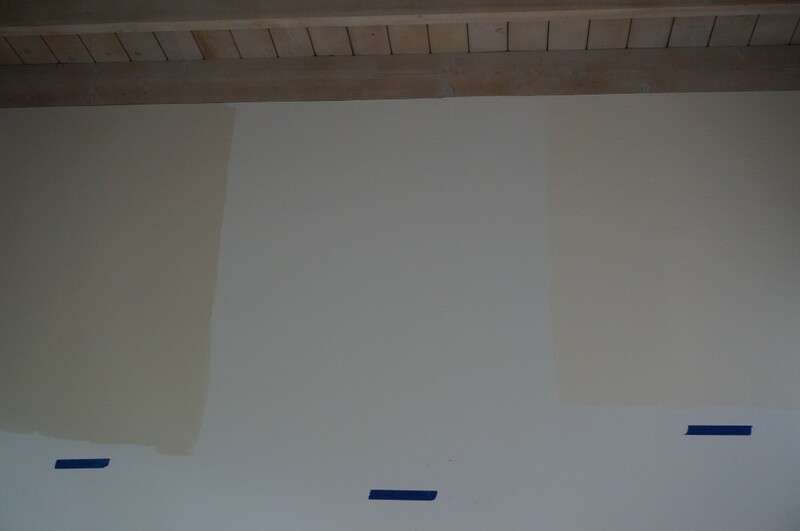 After asking design professionals and friends about their favorite white paint color, I had the painters put some big samples up near the whitewashed ceiling to see what played well with its pink/gray tones. From left to right – Bone White, Linen White and Swiss Coffee. Later on joined by White Heron, Dove White and Timid White. My friend Jana, a color consultant and the poet behind Green Olive Archives, weighed in by encouraging me not to pick anything with a pink base because it would skew the whole house heavily pink–”which could be limiting.” Otherwise, she assured me that any of the whites I was considering would be just fine. When I worried about the white walls being too bland, she reminded me that in this modernist house it will be my stuff that will bring color and interest. “But will the house feel too cold?” I said, confessing that I was leaning towards Swiss Coffee, one of Jenning’s picks. Jana noted that it was considered a warm white and one of the easiest ones to work with. “If the rooms feel too cold on a rainy winter day—or a foggy summer one–add something as simple as a bowl of oranges and it immediately warms up a room,” said Jana. She also confirmed what I was seeing on the walls–Swiss Coffee has a brown base which tones down the pinkish cast of the ceilings and now the color of the refinished cabinet fronts. 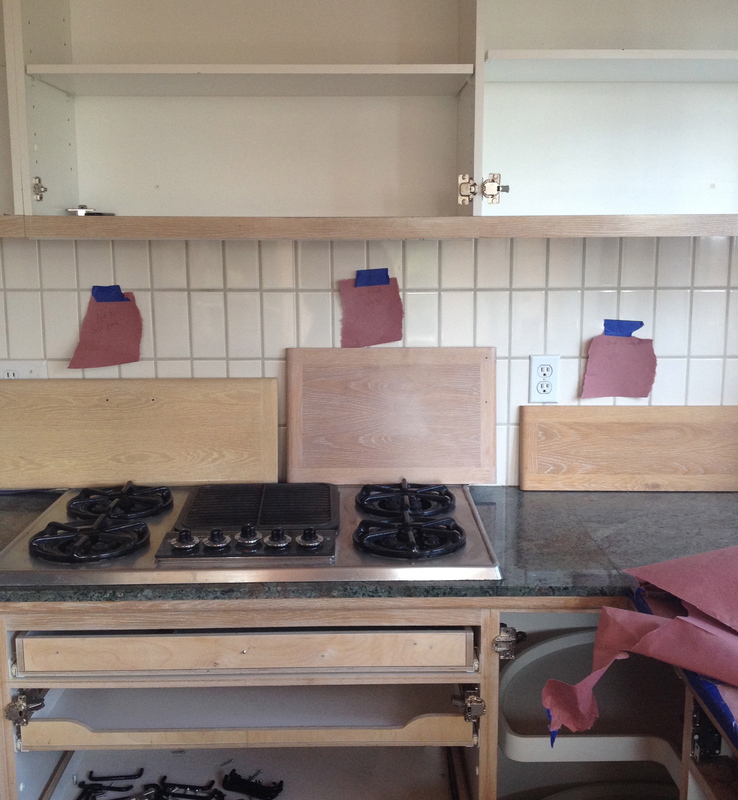 Hoping to stave off a full blown kitchen remodel, we wanted to keep the original cabinets but over time the varnish was peeling on the fronts near the windows and over the stovetop and had turned a plasticy yellow. 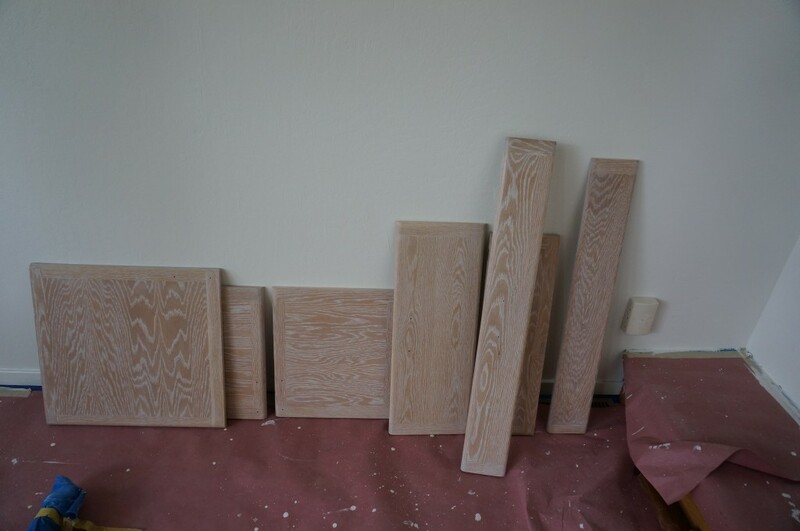 You can see the difference, above, with the yellowed cabinet front on the left, the stripped natural front on the right and the cerused cabinet front in the middle. I asked William Anderson, an Oakland-based designer with a classic, commonsense approach to design, to walk through the house and weigh in on a few decisions. He felt strongly that we should try to refinish the cabinets and not paint over them. Fortunately, our painter Steve was up to the challenge and stripped the old finish off then found a lime wax that he put over the natural oak to give it a cerused finish. The end result looks modern but retains the original vision of the house. 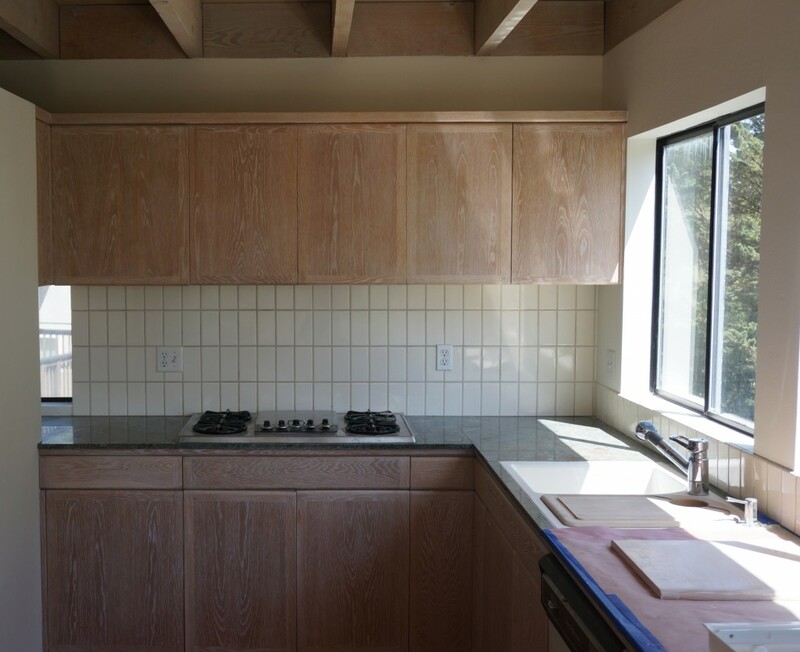 We’re not sure if the stone countertop was original (were they doing stone in 1979?) but it’s a nice piece of green granite and it seems such a waste to have it end up in a dump heap. My only hesitation is that the vaguely pink and green color scheme recalls my original everyday wedding china–Mikasa’s Silk Flowers (so 80s!) Perhaps down the road we’ll change out the tile, but it’s also in good shape and not unattractive. William agreed we should keep both the countertop and tile for now. 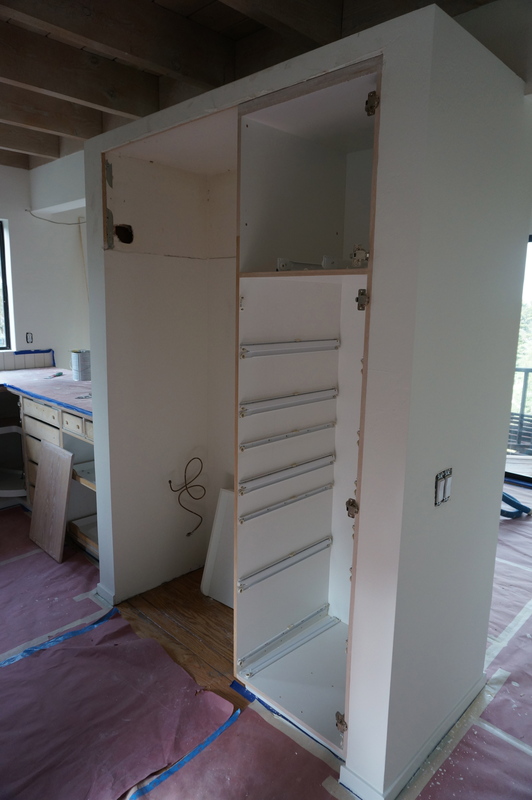 New hardware and appliances will help update the room. Besides the track lighting in the kitchen there is only one overhead light in the whole house and that’s in the entry. It’s a chance to make a statement so I want to take the time to find just the right thing for the space. In the meantime, I had the painters hang a simple ceiling fixture that I already owned from Berkeley lighting designer Sue Johnson. It echoes the entry pole (painted a dark grey per William’s suggestion) and really classes up the joint, don’t you think? 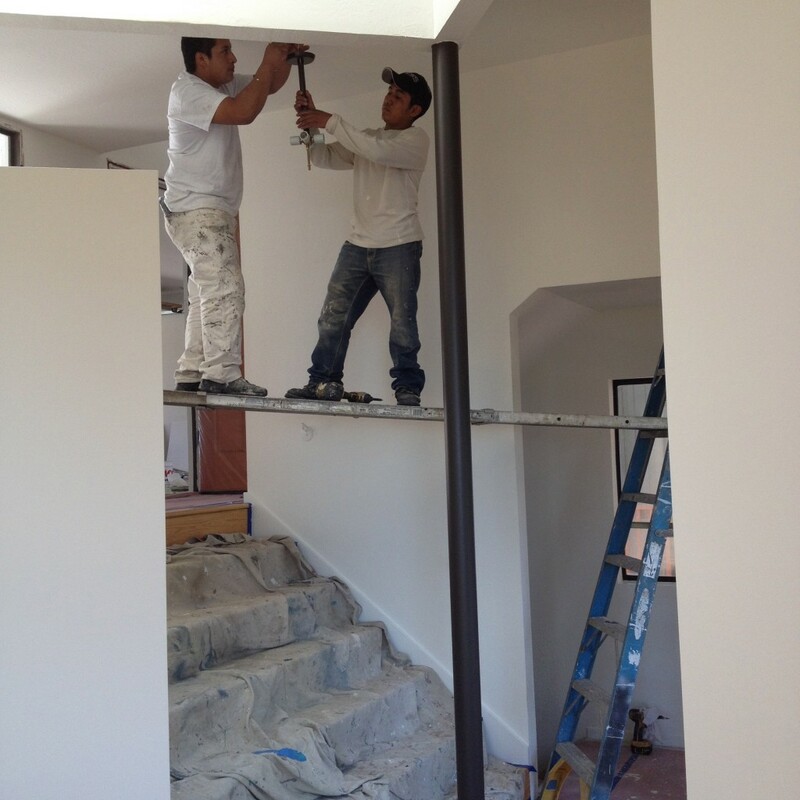 Here are some of the painters on a plank stretched between two ladders installing the fixture. 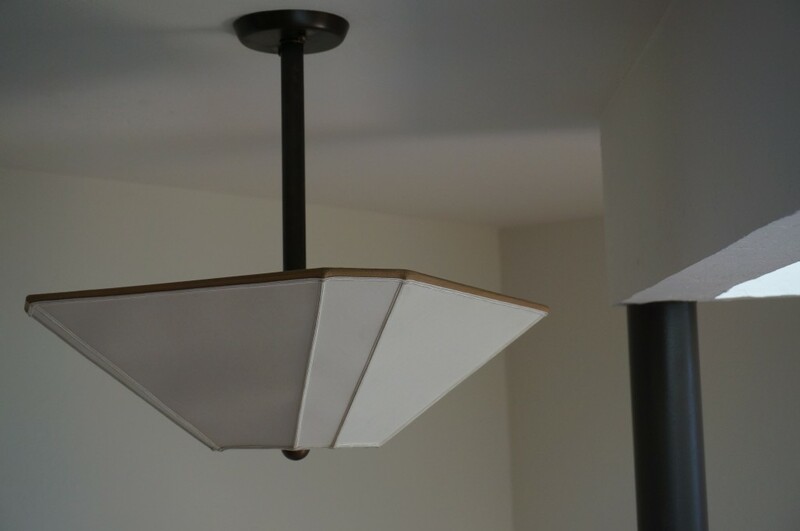 This rigamarole does not seem like something we want to replicate every time we need to change a lightbulb. (Broken hip, anyone?) So that will need to be taken into account when selecting the ultimate fixture for this space. 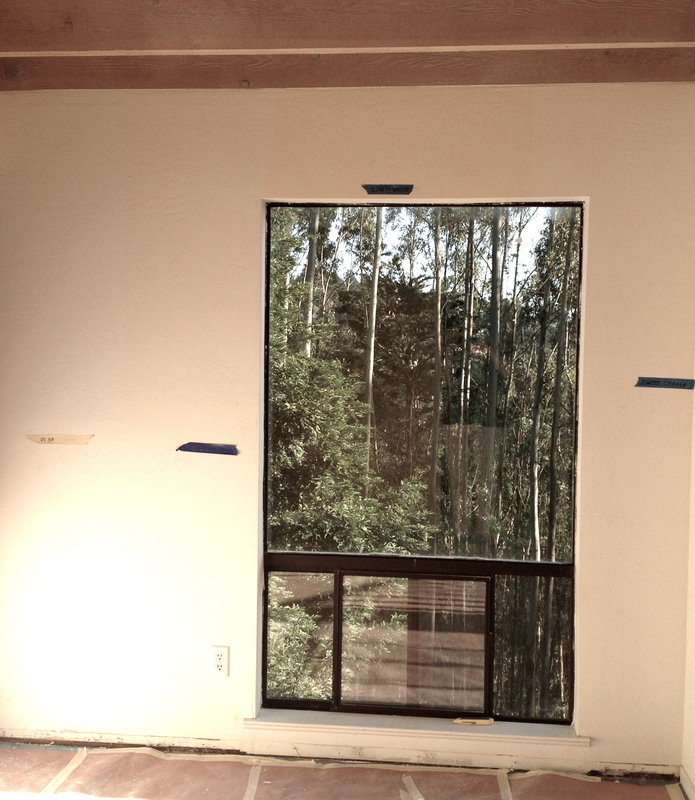 The painters are pausing for a week to work on a previously scheduled project. A carpenter will step in to modify some of the kitchen cabinets for the appliances and tackle some smaller projects at the entrance and in the master bedroom. Then the painters will return to clean things up. Out of order, I know—but with the quick close of the house we’re scrambling to schedule workers when they’re available. 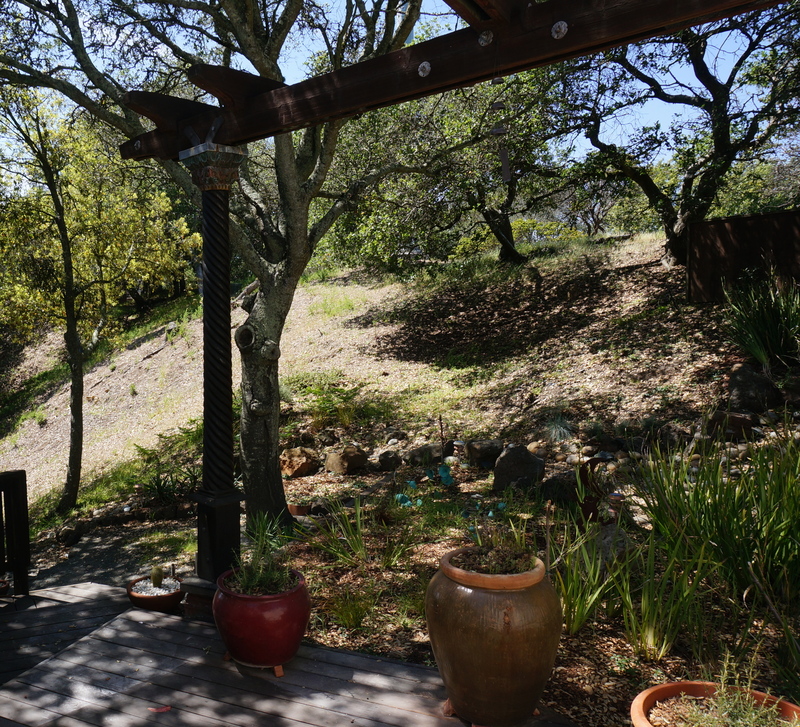 When it all gets to be too much, I’ll try to remember the morning I was out on the back deck and saw two foxes chasing across the ridge, their buff-colored tails lighting up the shade of the native oaks. Maybe the memory of those lovely creatures–and the desire to be up on the ridge with them–will help me retain the gumption that got trapped earlier in the remodeling chaos. 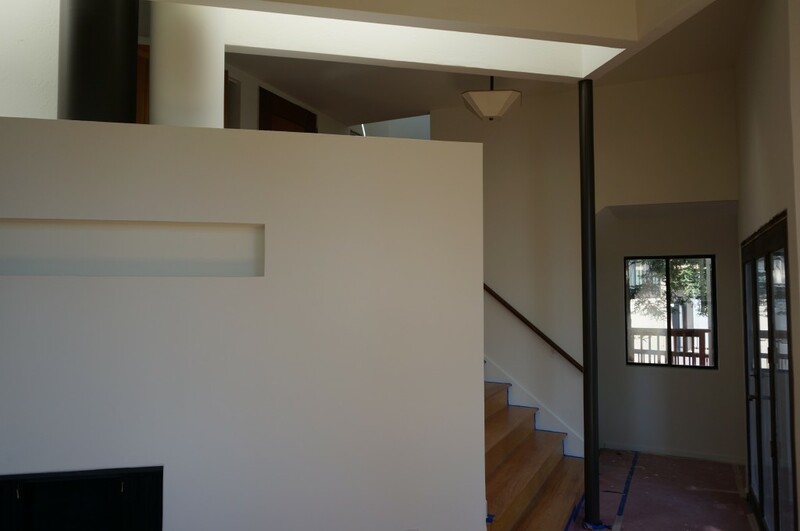 This entry was posted in Shelter and tagged Bay Area, interior design, remodeling. Bookmark the permalink. Post a comment or leave a trackback: Trackback URL. The kitchen looks so clean and simple now, but warm. BTW, I’ve lived with a version of Navajo White for over 20 years, which is very much a brownish warm white, and it’s been great. Very liveable. Not too cold, not soulless, none of that:). I hope the gumption trap is over. Thanks for sharing all of this, it is so fun to see all the changes!